Why wouldn’t the “classy” golddiggers be on the second floor? Seems contrary to our rules today where the higher you go in floors, the more expensive and exclusive? Plus, if they emptied their chamber pots from above, greater elevation has its perks. If they emptied their chamber pots…lol. That’s a servants’ job either way but you would want to be farthest from the stench. The British tv show Upstairs, Downstairs (Edwardian era) refers to master/servant respectively. 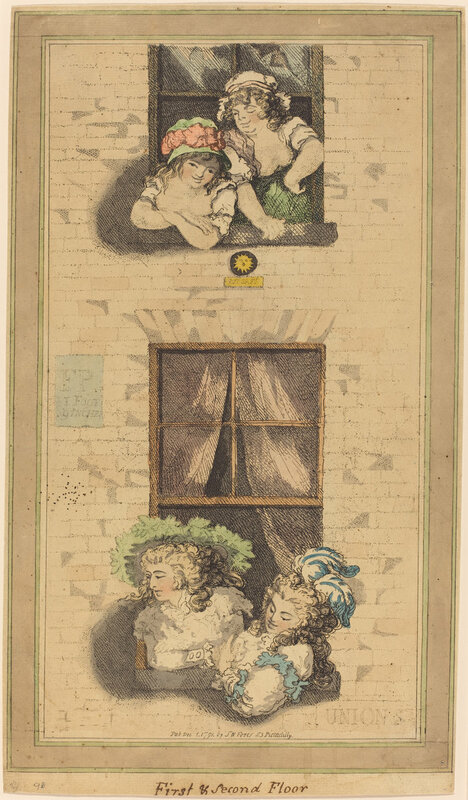 Typically, the servants’ rooms were either highest in the house (like attic high) or in the basement, so the second floor is probably wrong in terms of where hussies would be but it’s a satire so perhaps you’ve found an extra meaning layered within or further proof that classy and hussy become interchangeable despite appearances. Bonus points for paying attention! There’s actually a logical explanation to it. The servants lived in the attic or upper floors where it was drafty. The family had their bed chambers in 1st or 2nd floors where it was warmer, as usually below was the kitchen.